Yes, it’s National Donut Day, which means dough dealers everywhere are rolling out deals. Dough, for instance, is debuting its new matcha-sugar donut and offering a chance to get a year of free donuts to those who buy a box of six or more. Doughnut Plant is offering a one-day only pistachio donut, and giving out a mini cake doughnut with each order while supplies last. Buy a dozen or more donuts at Moe’s Doughs, in Greenpoint, and you’ll get four free, or you can just get a donut and a coffee for $2. And Dun-Well Doughnuts, in Bushwick, is offering a free donut with purchase of an espresso drink. 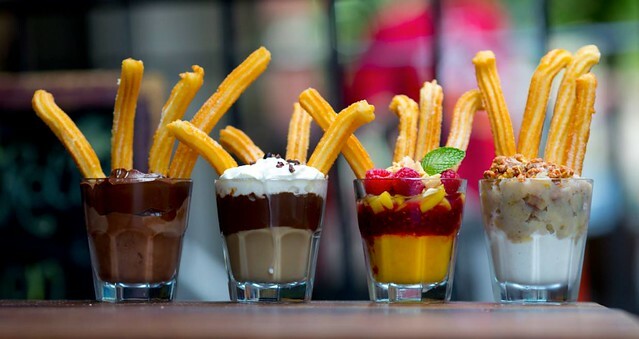 But forget all that, because churro cups. Where Valentine’s grub is concerned, I never thought my heart would stray from Doughnut Plant’s rose-petal doughnuts, but these heart-shaped churros really take the cake. And speaking of cake, La Churreria is also offering a churro cake for the V-Day season. Take a look.